I began this week in my Ohio hometown and flew home on Tuesday. Strange as it may sound, I was happy to be back to work and my normal routine. I love visiting my family but I start to feel very unproductive when I don't have a schedule to my day. Anyone else...am I nuts? And of course, I missed my husband and kitties like crazy too! I shortened the speed workout because it was HOT HOT HOT that day. This was the heat and humidity I'd been worried about on my trip, but luckily we didn't have it the whole time. It was over 90 degrees, and it felt even hotter on the rubber track. Still, I worked really hard and pushed the pace as much as I could for those 400s (paces 7:04, 7:19, 7:47, 8:02.) Those are quite good for me even if it is only for 400m at a time! Another really cool part of this workout is that my high school has a fantastic new-ish track. They put it in a year or two ago, but I hadn't checked it out until this trip. When I was in school, we had a cinder track that was super torn up in the front because the fairgrounds used it for a demolition derby. Even funnier? I ran 100m and 300m hurdles in 7th & 8th grade, but we only had 3 hurdles. Total. That means I only ran the full number of hurdles at the track meets. Nice, huh? I'm glad to report that situation is no longer an issue for my school! 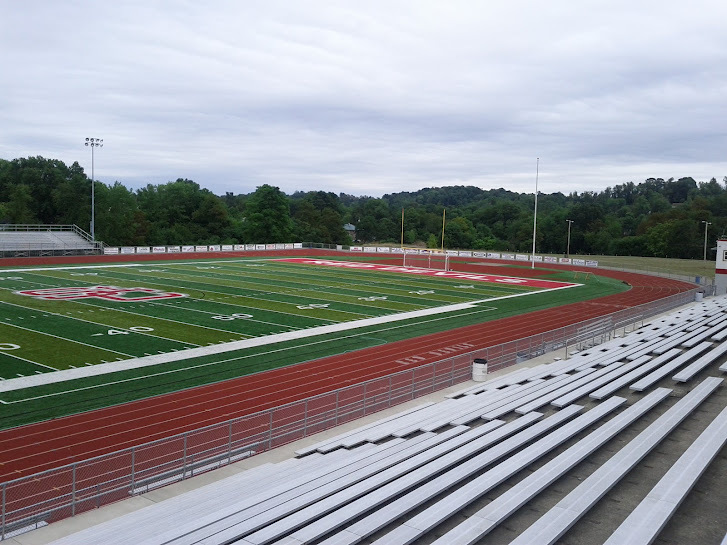 Pretty track, complete with turf football field. Flying all day. I left my hometown at 9 am Eastern to drive to the airport, took off on my flight at 12:25 pm Eastern, and finally arrived in San Jose via SFO and Caltrain at 6:45 pm Pacific. My hubby was amazing and had Thai takeout waiting for me at home. I didn't have a run plan for today, I just set out to enjoy the beautiful weather and sunshine before my strength class. This run turned out to one of the worst I've had in a long time. My legs felt tired, and my calves were incredibly tight and painful. It was all I could do to run, walk, stretch my way through that 3 miles. I've had calf and shin pain before, but it hasn't been like this in years. 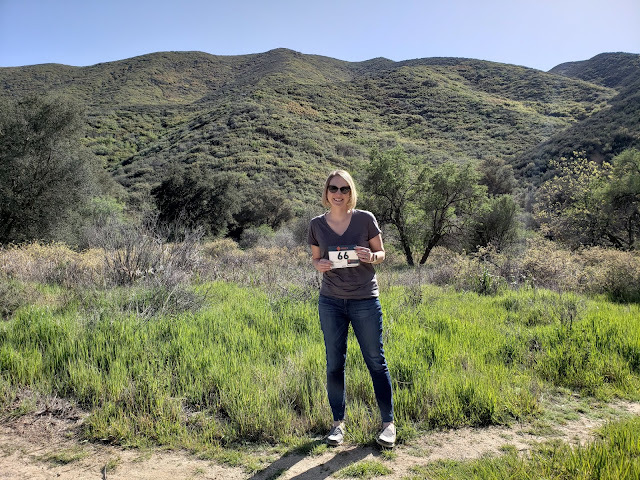 I was so distressed by this run that I wrote a blog post about it, and I've received amazing suggestions and support from people both in the comments and via Twitter. Thank you so much to everyone who was so helpful this week - I'm trying everything you suggested to heal/prevent this from coming back into my life. There was no run plan for today because of the previous days' tough one. I went for a walk/run to warm the muscles a little, then stretched in the gym. Calves felt a tiny bit better, but no where near how I want to feel. After the run, Oiselle teammate Meggie came over to the Goog for dinner. 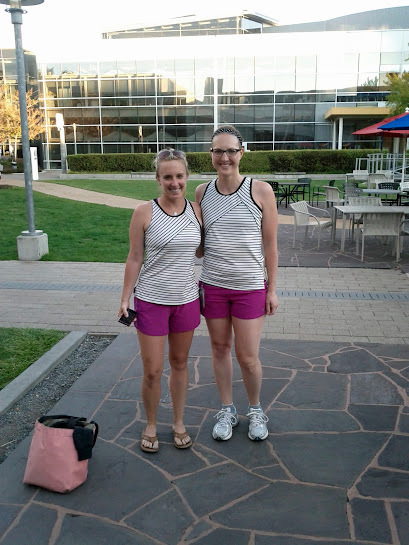 The crazy part - we showed up wearing the same outfit! I swear, this was not planned at all. It's just a rockin' outfit, clearly. Unplanned Rest Day. Something is obviously up with my legs, so I took another day. However, the non-running day turned out to be fantastic so I have to mention it. 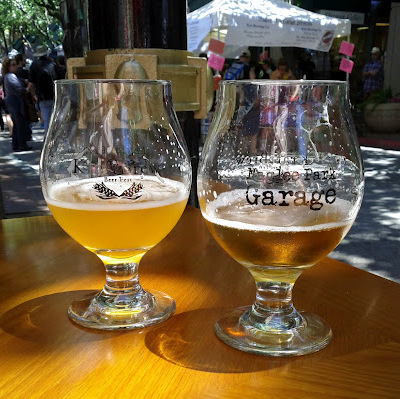 Hubby and I walked to the KraftBrew Festival in downtown San Jose. It's not often we can walk to a beer festival from our condo, so we took advantage of this one! 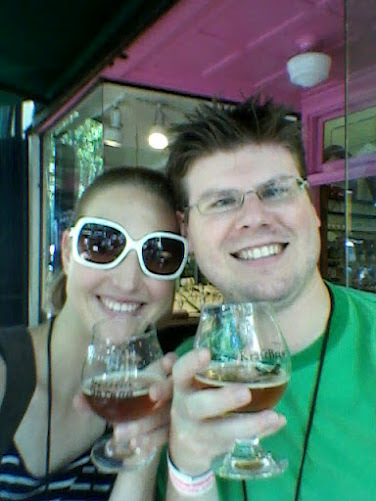 They gave us sweet tasting glasses, and you purchased tickets for beer tastings and food. We always got the taste portions so we could try many different beers. The glasses, which we got to keep. I'm sure I drank way too much beer for the good of my body, but it was so much fun to taste so many different ones in one place! I'd love something like that track near my house. I'd run the bleachers, do speed drills -- I'm honestly SO jealous!! I loved the track! I don't live by that track, but now I know I need to find one near me! I'll be visiting the HS track whenever I go back home for sure. Hope you had a lovely time in my state! I have the Fa shirt - it's on sale! I really do love Oiselle, and that's why I applied to be an ambassador. I've been sooo happy with everything from them. RunningWarehouse.com sells it, free shipping & free returns if it doesn't fit. That is so funny that you and Meggie showed up wearing the same outfit! Too funny. Love that stripey tank. I've been eying it and need to order! so funny you guys both wore the exact same outfit. hilar! They've had it on RunningWarehouse.com - free shipping and free returns. In case you want to check it out, I highly recommend the simplicity tanks!